With the advent of Spring, what better than a lovely glass of Rosé. The growth in popularity of Rosé over the past few years has been meteoric, but Rosés are nothing new, in fact you could say that the earliest wines were in fact Rosés of sorts. If you look at early renaissance art, you’ll see that quite often the red wine being consumed is depicted as kind of a pink colour, rather than the deep crimson reds we would expect. Production of red wine as we know it today is produced by leaving the juice in contact with the skins for a period of time – something that has only become common practice in more recent times. There are three different methods of producing Rosé. The most widely used is the skin contact method of pressing red grapes and removing the juice from the skins within just a few hours – the depth of colour is determined by just how much contact with the skins these wines have had. The second method is the saignée method, where the juice that ‘bleeds’ from the grapes when producing red wine is removed after picking and before pressing to impart more tannins and flavour into the red wine, while the juice that was removed is then fermented separately to produce a form of Rosé. The final method is by blending where small quantities of red wine are blended with white wine to enhance the flavours and to achieve the rose colour. Made with Merlot grapes grown on some of the first vines to see the sun of the new day. This Gisborne winery was established back in the early 60s when founder Bill Irwin pioneered the wine industry in Gisborne. The Merlot grapes used in this wine were carefully selected form vines grown on the Briant’s Patutahi vineyard – one of the eastern most vineyards in the country. Given that New Zealand is on the dateline and you won’t find any vines east of Gisborne until you reach the Americas, they can safely say these vines are the first in the world to see the sun of the new day. The regions unique terroir and high sunshine hours, have produced a wonderful, fruit-driven Rosé, strawberry pink in colour with salmon hues and lovely summer berries and floral notes on the nose. On the palate you’ll find a lovely creaminess with ripe summer berries. A delightful wine and great value for money. Madam Sass has turned a shade of pink. On the back of two outstanding Pinot Noir releases, Madam Sass has finally released a Pinot Rosé that we are thrilled to say emulates the same high standards of her darker cousin. Hailing from Bendigo in Central Otago, the name pays homage to the women that shaped the gold rush era in these hard valleys. The valleys that once produced gold are now producing something a lot softer it would seem, still turning it into gold with New World selecting it as their champion Rosé in the New World Wine Awards 2018. The grapes come for a vineyard called Claim 431 – the original miners gold claim in Bendigo. Enticingly rich and full of attitude, the wine has lovely floral notes and is vibrant with berries and stone fruits leading to a lovely – well balanced and mouthwatering – spicy finish. Mount Michael is a boutique winery that is starting to gain a lot of attention. They have consistently won recognition over recent years for their production of outstanding Pinot Noir. Using grapes grown exclusively on their own block, and in very small parcel, enables them to create wines of the highest quality. Situated in the heart of some of the best Pinot Noir growing region in the country in Bendigo, Central Otago, they are creating some outstanding wines. Owned and operated by Anna Dunsdon, one of New Zealand’s youngest winery owners, they recently secured Jody Pagey, of Terra Sancta fame, as their winemaker who describes their Pinot Noir Rosé as being in the classic Central Otago style, with bright, pure fruit and freshness. 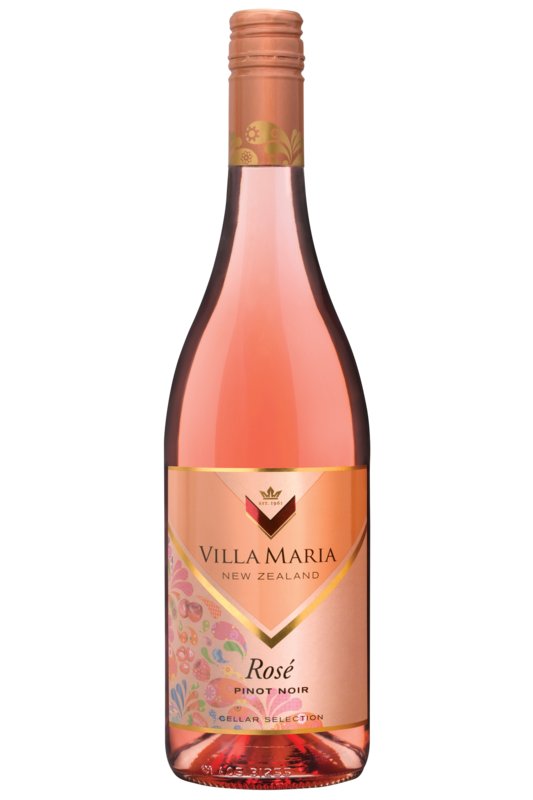 Perfect cherry pink in colour with aromas of fresh strawberries, maraschino cherries, ripe peaches and cream, lead to a lovely fresh watermelon taste bursting in the mouth with freshness of summer. The Cellar Selection range from Villa Maria delivers some of the best value for money options you’ll find. It is readily available and the selection is always of a consistently high standard (reserve quality at much better price). The 2018 Cellar Selection Marlborough Pinot Noir Rosé is in its second vintage under the new label. The label, the high quality of this wine and the great price, made this one of the hottest selling Rosés of last summer and judging by this latest release we can only expect that meteoric rise to continue. Marlborough is producing some outstanding Pinot Noirs and like other Marlborough wines, possess nuances you won’t find anywhere else.The freshness and abundant fruit flavours capture ‘summer in a glass’ with aromas of fresh strawberries and spring blossoms on the nose and juicy watermelons and red cherries come through on the palate with a crisp vibrant finish. This wine epitomises the taste of the summer to come. Bollinger is a brand that we absolutely adore here at M2woman. It epitomises style and speaks of success. It is the glass you raise in recognition of achievement. It is the choice of M2 for occasions like the M2 Man of the Year. Champagne Bollinger has been the choice of Kings and Queens, the choice of James Bond and even the choice of those AB Fab girls. “I drink Champagne when I’m happy and when I’m sad,” – Madame Lily Bollinger. Bollinger Rosé however takes us to a whole new level. Presented in the classic Bollinger shaped bottle with a lovely pink foil, it emanates a certain amount of power, yet a soft tenderness that gives you an indication of what to expect in the bottle. The Champagne is a bright rose colour with subtle golden hues. The aroma is of rich berries, red currant and wild strawberries with a touch of spice – similar to their Special Cuvées. The sense of vivacity on the palate with wild berries, is balanced beautifully with a soft velvety sensation of the bubbles. Regardless of gender, this is a wine that makes a statement of substance unrestrained by social structure.